Providing a nutritious diet is perhaps the single most important thing you can do to ensure a long, happy life for your pet rabbit. Rabbits' dietary needs are fairly simple, and keeping them well-fed doesn't require spending a lot of money on exotic feeds or nutritional supplement. It does require some attention to your rabbit's physical condition and making adjustments throughout their various life stages. Here we'll offer a simple guide to rabbit nutrition. 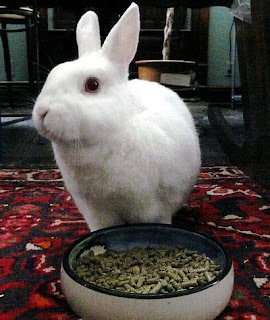 There are three basic components to a healthy rabbit diet: hay, fresh vegetables, and pellets. Of these three, hay is by far the most important, so we'll begin there. Hay most closely approximates the rabbit's natural diet of grass, and is the best possible source of long-strand fiber. As in humans, fiber promotes digestive health by pushing softer material through the tract, and stimulating the muscles of the colon. Unlike humans, rabbits are at risk of death if their diets lack fiber. Rabbits groom themselves in the same manner as cats- by licking- but unlike cats, they are unable to regurgitate hairballs. This means that there's only one way for those big clumps of hair to get out of the stomach- through the excretory system. A high-fiber diet will keep hairballs moving along, but if this does not occur, the digestive tract will become blocked, and the rabbit will starve to death. Thus, hay is essential, and should provide the bulk of your rabbit's diet. Several varieties are commonly offered as rabbit feed, with somewhat different nutritional qualities. One of the most common is alfalfa, which is a fairly rich legume hay. Although it is ideal for young (ie, not yet full-grown) rabbits, or those that are pregnant or nursing, alfalfa has a bit too high of protein content to be appropriate for mature rabbits. Mature rabbits can get a bit of alfalfa mixed in with a less rich hay. Timothy grass hay is one such staple, with very good fiber content, low protein to prevent obesity, and also a low calcium content. This last part is important, as overconsumption of calcium can lead to urinary tract problems. Timothy hay can be fed free choice- in other words, put in as much of it as you like. There should be a constant supply of Timothy hay, or another free choice hay such as Orchard grass or Brome hay, available to your rabbit at all times. For a full complement of vitamins and nutrients, you'll also want to offer fresh vegetables. In the wild, rabbits have a wide range of plant matter to forage from, and you'll want to simulate this broad-based diet with your selection of vegetables. Look for dark green leafy material- colorful, as a rule, means nutritious. Romaine lettuce, dandelion greens, beet tops, and similar greens are good choices, while iceberg lettuce is pretty much just water and cellulose, and isn't worth feeding. Carrots, of course, are good, but root vegetables like potatoes or beets are to be avoided. Also importantly, you'll want to include at least one veggie with a plentiful supply of Vitamin A. This includes carrots, beet tops, parsley, endive, and collard greens. You can also offer kale, mustard greens, or spinach, but be conservative with these, as they contain compounds that can be toxic in high quantities. Veggies to avoid entirely include any kind of bean, potatoes or beets (not including greens), rhubarb, nuts, peas, onions, and corn. As always, changes to the rabbit's diet should be introduced slowly and the rabbit should be monitored carefully for changes in digestive functioning. Try to keep about three different veggies in your rabbit's diet at a time, and rotate new ones in every so often. If the rabbit's weight remains stable, and it doesn't seem to be suffering from soft stools, gasiness, or any other digestive problems, keep doing what you're doing. In terms of quantity, a good rule of thumb for mature rabbits is 2 cups of vegetables per day for every 6 pounds of rabbit. Finally, rabbits should receive moderate quantities of pelleted food daily. These are dense packages of protein and energy, so remember that overindulgence is going to have consequences. You'll want to choose a food with as much fiber as possible- at least 18%. You'll also want a fairly low protein content, somewhere around 12-14%, and as little calcium as possible. A recommended intake of pellets for mature rabbits is somewhere between ¼ and ½ cups per day, per 6 pounds of rabbit. You can decrease this amount by up to 50% by offering more fresh vegetables. As always, keep an eye out for changes in weight or runny stool. Getting your rabbit's diet just right can be a little tricky. Rabbits are creatures of habit, and very fussy- some have been known to starve themselves to death rather than accept food that did not suit them. If the rabbit refuses to eat something in its diet, you can try reducing the available amount of other foods, but don't turn this into a test of wills, as it may become a fight to the death. You can also try hiding or mixing treats in with the unwanted food item, and hope that the rabbit begins to associate the yummy treat with the “health food”, but of course treats should only be offered in very small quantities. Don't be afraid to experiment and be creative, especially when choosing vegetables, as there are a wide variety of possible choices. Just remember to introduce any changes to your rabbit's diet gradually, always monitor its conditions, and keep an abundant supply of hay available. With these guidelines in mind, you should have healthy, happy rabbits for years to come. When deciding on how to house your pet rabbit you have two choices: either quality Rabbit Cages or durable Rabbit Hutches, whichever you choose make sure they are made with durable quality materials to stand the test of time.